A list of content entries. The list of content entries. Maximum number of entries to fit in 255 bytes. Constructor from a binary descriptor. [in] bin A binary descriptor to deserialize. 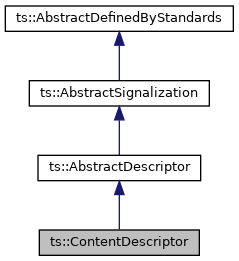 Static method to display a descriptor. [in] payload Address of the descriptor payload. [in] tid Table id of table containing the descriptors. [in] pds Private Data Specifier.